Fender Standard Stratocaster SSS: A smart choice for serious beginners. It is no secret that the Fender Stratocaster is one of the most popular guitars in the world. 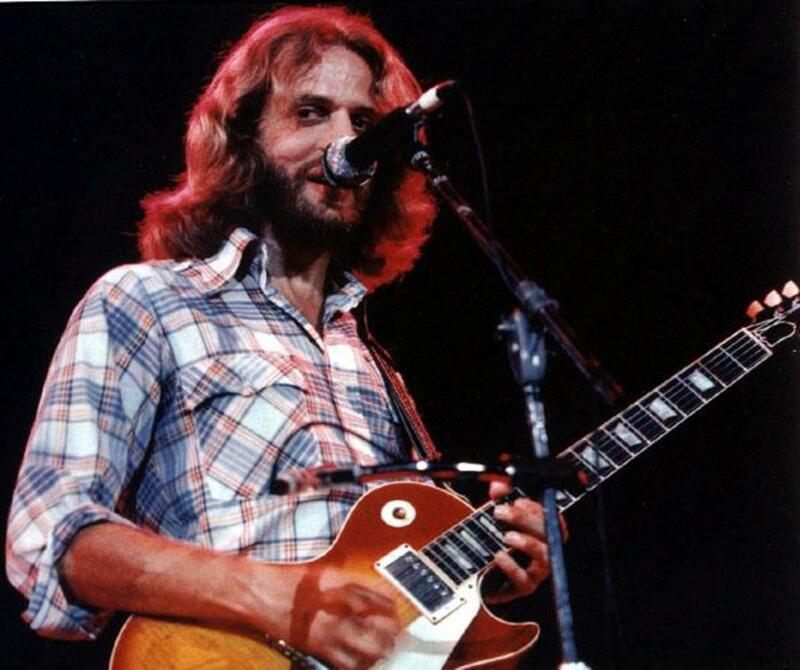 It has a legacy going back decades, and has been used by legendary guitar players to get the sounds they need it every imaginable style of music. Even if you know very little about guitars you’ve probably seen a Strat before, and you’ve definitely heard one. Fender Stratocasters are high-end, American-made instruments, and when you are an advanced guitar player someday you may just get to own one. Or, maybe you’ll own a few of them. As a beginner, unless you are prepared to drop a ridiculous amount of cash on your first guitar rig, these guitars are out of your price range. Fender to the rescue! Through their budget Squier by Fender lineup and their Made-in-Mexico Standard Series Fender brings us real Stratocasters that are not only affordable, but sound and look almost as good as the original. When it comes to electric guitars for beginners, Squier by Fender, along with Epiphone, are the brands I always recommend. In this article you’ll learn about the different models in the Squier and Fender Standard lineup and get some advice on choosing the right Strat for you. Squier by Fender offers a few different starter kits for beginning electric guitar players. You can find an array of different guitars (both Stratocasters and Telecasters) and even bass setups. Remember, Squier is owned by Fender and makes budget versions of classic Fender instruments. You’ll see a lot of Strat copies out there, especially in the beginner guitar market. None of the guitars in this article are “copies”. Squier makes real Strats. The most basic Squier starter kit is very affordable, and features a quality guitar and amp that will keep a newbie busy for a while. You get a Squier Affinity Stratocaster with three single-coil pickups (SSS) for all of those legendary Strat sounds. Single coils have a thinner sound than humbuckers, and this is the tone the Strat made famous. 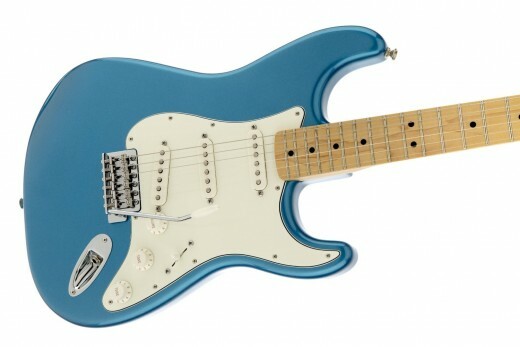 This classic Strat design is great for beginners who are into blues, country and rock. For those newbie guitarists who are into heavier rock or metal, I suggest choosing a pack with an HSS Strat. This will give you a guitar with a humbucker in addition to two single-coil pickups. You’ll get some thicker, heavier sounds, and a wider tonal palette to experiment with. The amp that comes with the kit is a Fender Frontman 15G. You also get other good stuff like a cable, strap and picks. For the average beginner, I think a starter pack is a smart way to get into guitar for not a lot of cash. The Squier Stratocaster starter kit gets my top recommendation. It has everything you need, and makes the process of putting together your first guitar setup simple and affordable. The Squier Standard Strat is a notch better than the model you’d get with the Squier starter pack. This guitar has the classic tonewood profile of a Fender Strat: Alder body with a maple neck. 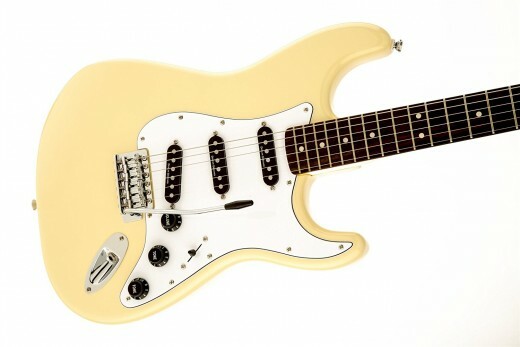 Of course it has those three single coil pickups as well, with all the control you’d expect to find on a Fender Strat. Point is, this thing is a real Stratocaster, and for beginners into rock, country and blues the Squier Standard Strat is a solid choice. Once again, you may want to consider a HSS model if you’d like the addition of a hotter-sounding humbucking pickup. Squier has a cool Black and Chrome Strat in their lineup that will appeal to the more aggressive crowd. Choosing a guitar like the Squier Standard Strat for your first guitar is a smart choice, in my opinion. It gets you started with a better instrument that will last you well into the intermediate stages of your playing career. However, there are a few negatives when compared to choosing a starter kit. The first is cost. You will generally spend a little more when you get each piece of gear individually. Secondly, you’re going to need an amp. There are some great beginner’s guitar amps around $100 that would complement the Squire Standard Strat and make for an outstanding starter rig. You can learn more about them in the post below. The Squier Vintage Modified Strat and Classic Vibe Stratocasters are great guitars for beginners. They have become known as some of the best budget guitars on the market, and even veteran players have good things to say about the Squier Vintage Modified and Classic Vibe Series Series. There are several Strat models in the Squier VM Series, and each is based on a hot-rodded Strat from days gone by. Choose between the basic Vintage Modified (SSS or HSS), Vintage Modified ‘70s, Vintage Modified Surf Strat, or the eclectic Squier ’51. My favorite is the Squier VM ‘70s Strat in vintage white. 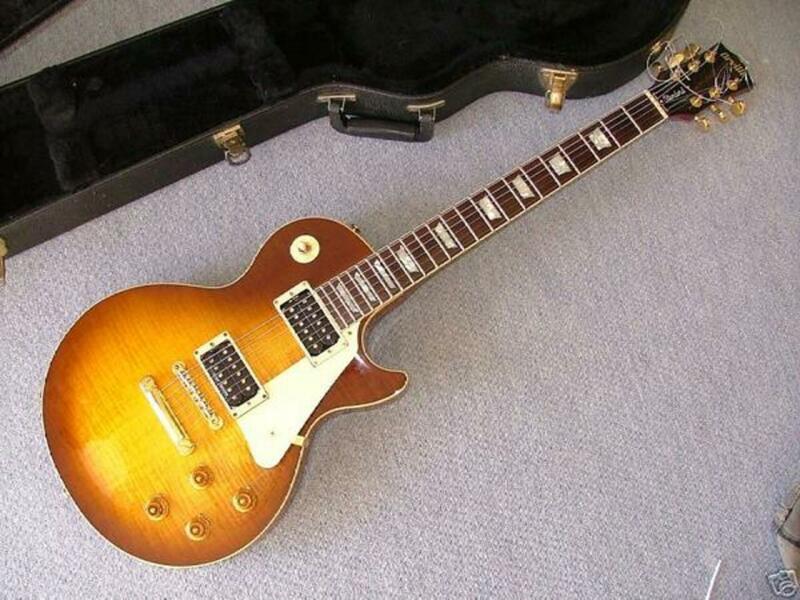 It not only looks great, but in my opinion it is one of the top electric guitars under $300. I like that it has a basswood body instead of Alder for a more resonant tone, and the cool Duncan Design single coils are a nice departure from standard Fender pickups. The Classic Vibe Series is based on Fender instruments from the ‘50s and ‘60s. These guitars do their best to replicate all of the things players loved about the Strats of yesterday. These Stratocasters put Fender on the map! My opinion: These are the best Stratocasters for the money you are going to find. This also makes them perfect for serious beginners who want something a little better than the typical starter guitar. For their Standard Series of guitars and basses Fender takes some of their most legendary instruments and finds a way to make them more affordable. One of the ways they cut costs is to outsource construction to their facility in Mexico. This is why Fender Standard instruments are referred to as Made-in-Mexico or MIM Stratocasters. These are excellent guitars for intermediate players, and some gigging musicians even prefer to use an MIM Strat for work and leave their American Stratocaster at home. While the MIM is certainly more expensive than a Squier, it still comes in around half the cost of an American Strat. I recommend these guitars for adult beginners with a few bucks in their pockets, who know they want to start out on a quality guitar from the beginning. You won’t have to upgrade your instrument for a long while, if ever. The MIM Stratocaster is one of the top electric guitars for the money period. There many different models made in Mexico, starting with the basic SSS version. This is the base model with three single-coil pickups, and it is the design most people think of when it comes to the Stratocaster. The SSS Standard features and Alder body with a maple neck and choice of either a Rosewood or Maple fingerboard. The pickups are a trio of Fender single coils with the basic 1 volume, 2 tone Strat layout and 5-way switch. The bridge is a vintage-style synchronized tremolo. It’s a very basic design that has served Fender well for more than half a century, and in the MIM Strat it comes together well to present an affordable, high-quality instrument. However, there are other MIM Stratocasters in the Fender lineup worth checking out. The MIM Strat is also available with a humbucker and a pair of single-coil pickups. The single coils let you nail those blues sounds and bassy cleans, while you can kick in the humbucker for hard rock riffs and a thicker tone. While the number of available sounds isn’t as many as with the SSS pickup configuration, the HSS Strat does allow you to reach out into heavier styles of music. In my opinion, this is the best of both worlds when it comes to the Stratocaster. In fact, one of my main guitars these days is a Fender MIM Stratocaster HSS. I have traditional Strats with three single coils, and I have other guitars with humbuckers designed for heavier music, but I always seem to reach for my Standard Strat. I suppose it is the flexibility that I like, to be able to go from Metallica to SRV with the flip of a switch and the turn of a knob. Fender also has a couple of new entries in their Standard Stratocaster lineup starting in 2015: The HSH and HH Strats. These guitars feature a pair of Fender Blacktop Humbuckers, in the case of the HSH model with a Fender Single Coil sandwiched in between. 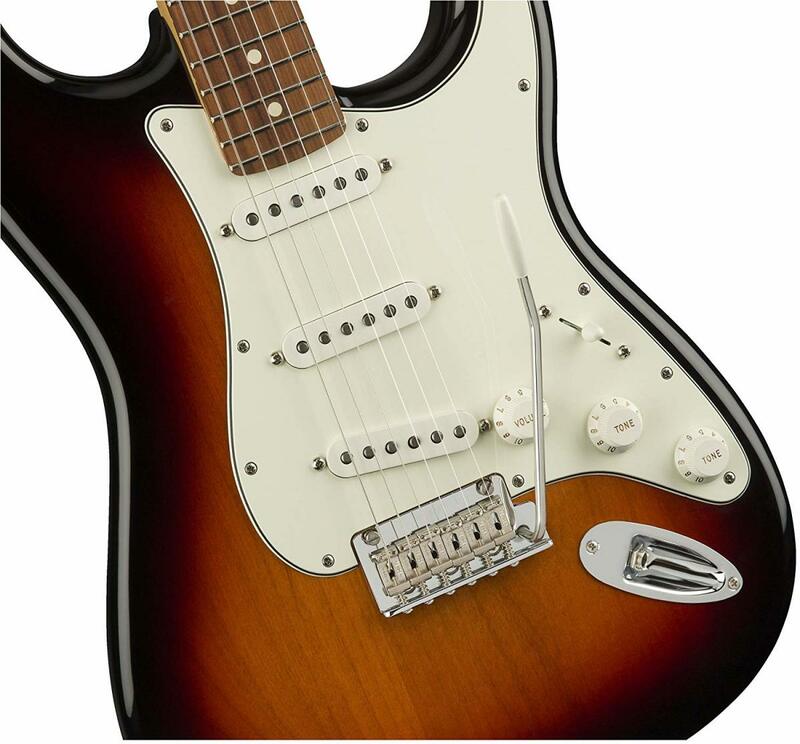 The electronics feature a push-pull coil tap in addition to the basic Strat control layout. This means you get the benefits of both a humbucker and single coil in the same pickup. There is also a Floyd-equipped HSS model that features the Blacktop Humbucker with coil split. All three are available in Olympic White, Black and Ghost Silver finishes. I think the Olympic White finish with the black pickguard looks particularly classy. Fender has had various guitars with HH and HSH pickup configurations in their lineup through the years. Some players love the Strat design but prefer humbuckers in both the bridge and neck position. 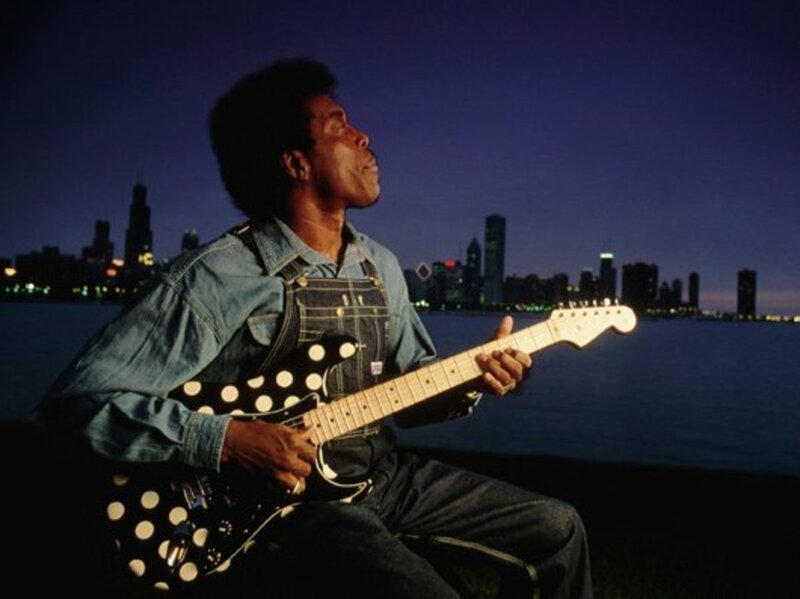 If that’s you, it’s tough to beat this version of the MIM Stratocaster. You’ve read about a bunch of awesome Squier and Fender MIM Stratocasters in this article. How do you choose the right one for you? I think it simply comes down to your budget, what kind of music you intend to play and which tones are most important to you. The Squier models are affordable for beginners and offer the same designs seen in high-end Strats. For most beginners my advice is to go with a starter pack. It takes away the guesswork that comes with choosing everything you need to start playing guitar. They are also great values, something that’s important if you aren’t sure you are going to stick with the instrument. The basic SSS Strat is great for blues, country and rock, Each notch of the pickup selector switch gives you a distinct sound, from glassy, open bass tones to chickin’ pickin’ sounds reminiscent of country music, to Hendrix-ish rock tones. If you want a basic, flexible guitar, the SSS model may be the way to go. For guitarists into heavier rock and metal the single coil in the bridge position may not cut it. You need a humbucker for a thicker sound, and while a Strat with humbuckers won’t sound like a Les Paul is will allow a much heavier tone compared to the SSS model. You will also see some budget Stratocasters equipped with Floyd Rose-type bridges. Is this a good choice for a beginner? My advice is always to think long and hard before making your decision. Like a hot-rodded muscle car, a guitar with a Floyd needs regular maintenance and work to keep it in tip-top shape. If you don’t think you’ll use a Floyd Rose enough to warrant the extra attention you’re probably better off with a basic bridge. I hope you found this post helpful. Good luck choosing your first Stratocaster! 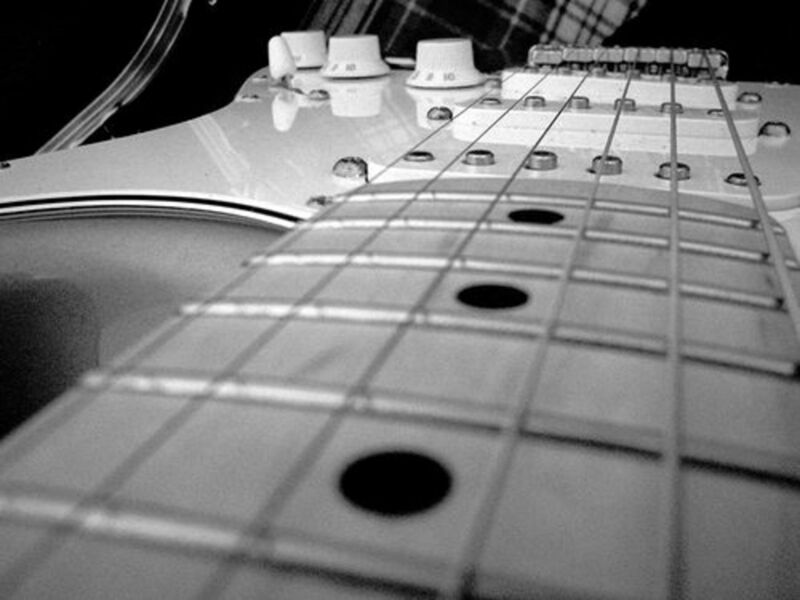 Your Opinion: Which Stratocaster is best for beginners? Which Squier or Fender instrument would you choose?